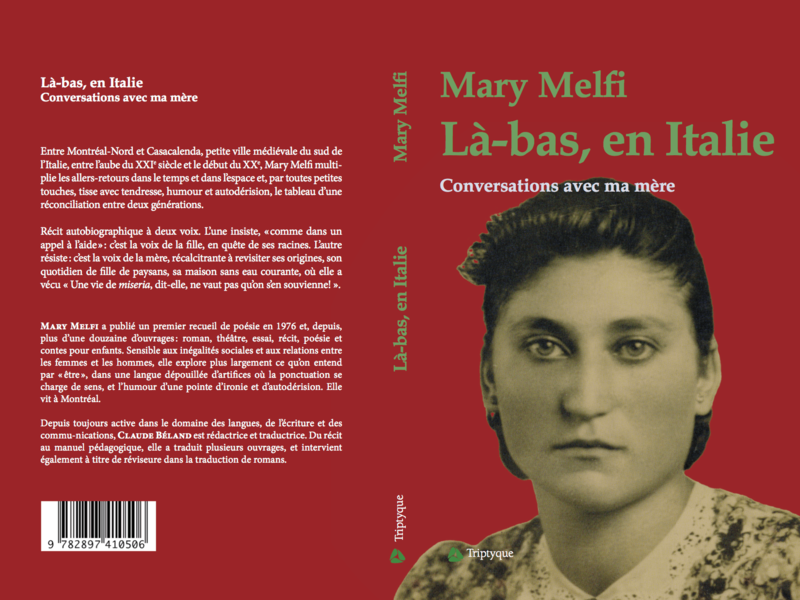 On October 13th, Editions Triptyque will be holding its seasonal book launch, where they will be launching La-bas, en Italie, the French translation of Mary Melfi’s Italy Revisited. The launch will take place at 5:30 PM at La Maison des écrivains de l’UNEQ (3492 avenue Laval, Montreal, metro Sherbrooke). Other titles that will be launched include: Chaux by Joel Des Roisiers, Une fille trop curieuse by Stéphanie Gauthier, Pas d’autres dieux by Francois Lepage, Carpe et chienne by Janis Locas, Hangar No 7 by Paul Mainville and Les jours tigrés by Diane-Ischa Ross. Mary Melfi was born in a small mountain town south of Rome. She received a B.A. in English Literature from Concordia University and a Masters of Library Science from McGill University. Since completing her studies in 1977 she has published over a dozen books of critically-acclaimed poetry and prose. Mary Melfi’s plays have been workshopped in Montreal, Toronto and Vancouver. Her two full-length plays, both comedies, Foreplay and My Italian Wife were published by Guernica Editions in 2012. She received the Giornata Internazionale Della Donna Award in 2010. In-depth reviews of her published works can be found in William Anselmi’s book entitled: Mary Melfi, Essays on her Works (Guernica Editions, 2007). Mary Melfi presently lives in Montreal. About Italy Revisited: Taking an unconventional approach to autobiographical writing, this work serves as a double memoir, told in dialogue between a mother and a daughter. The conversation takes place in a medieval town high up in the Italian mountains, as the author, a Canadian writer, draws out her mother’s childhood memories of life in southern Italy at the beginning of the 20th century. As they re-create that vanished world, the pair also finds greater understanding of the tumultuous relationships that sometimes exist between immigrant mothers and their children. Tagged with Book Launch, Editions Triptyque, Italy Revisited, La-bas en Italie, Mary Melfi, translation.